Posted on 27. Sep, 2010 by Corey in All, General Baseball. Year after year you hear about big league veterans messing with first year players. The most popular is once a year during the game on a getaway day before the team leaves town, the rookies personal clothes are taken from their lockers and replaced with some sort of embarrassing outfit or Halloween costume. The rookie then must wear it out of the stadium and onto the team flight to the next city. Plenty of pictures always leak out of these embarrassing situations. 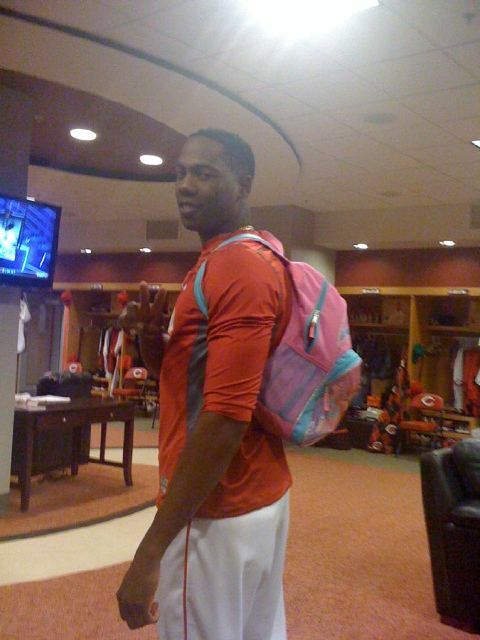 Another one of my favorite rookie hazing moments is one that can last the entire season. 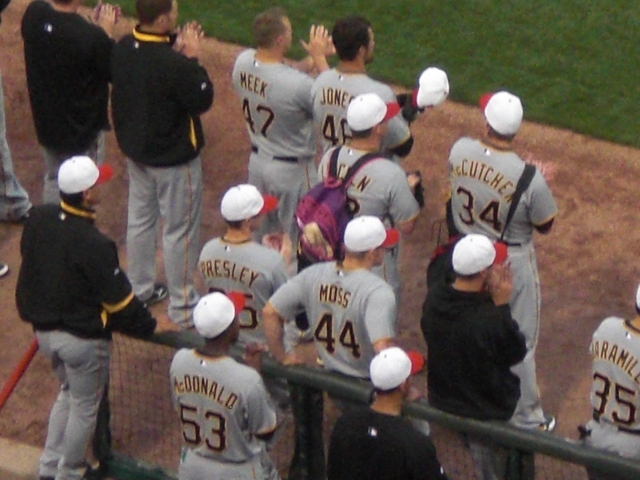 It is the carrying of the “bullpen backpack.” The pack is usually a kids looking school backpack filled with the necessary items that pitchers may need during a game in the pen like bubble gum, sunflower seeds or energy drinks. Usually the pitcher with the least amount of big league experience must wear this pack to the pen. For teams like the Pittsburgh Pirates and Cincinnati Reds, these backpacks are pink and purple. While at the game several weeks ago, I snapped some pictures of a Pirates rookie carrying the pack to the bullpen. Also pictured is Cincinnati Reds rookie Aroldis Chapman carrying the Reds pink pack. This was the job of Sam Lecure before Chapman joined the team as a rookie. Next time you are at a big league baseball game, watch right before the game starts and all the relief pitchers make their way across the field to the bullpen and see if you can pick out the rookie.